In addition to our work with smallholder farmers we also work with men and women who are keen to set up small businesses outside of farming. The Malawian economy suffers because it lacks a vibrant small and medium sized business sector which can drive future employment and growth. However the tragedy is that there are plenty of men and women who would love to set up their own business and have ambition and ideas. A key cause of the problem is the lack of suitable finance. The commercial banks tend to generally lend short term with interest rates of over 50% and also demand security. The microfinance organizations do a wonderful job for micro businesses with high stock turnover but, their loans are also short term and the rates of interest even higher than the commercial banks. By contrast, MicroEnterprise Africa provides long term, interest free venture capital loans linked with some equity participation. In addition, experienced professionals work alongside the entrepreneurs and give close technical and professional support. We give examples of some of these businesses on this page. 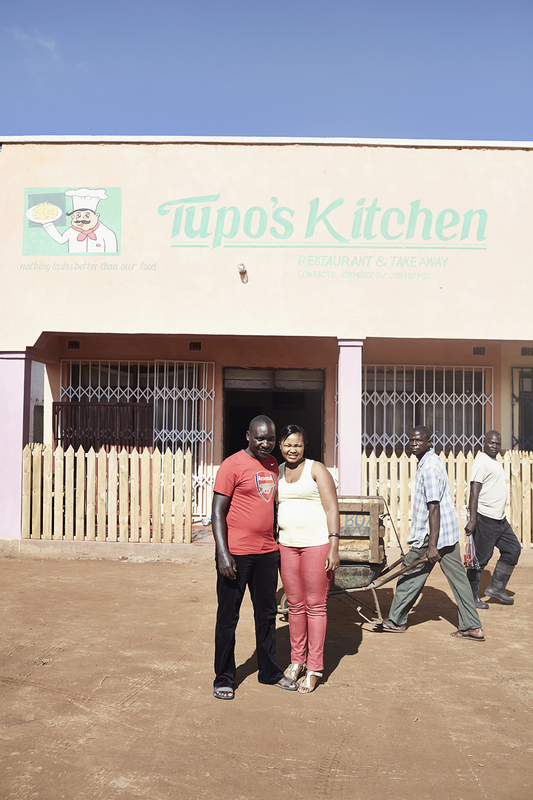 In December 2013, Atherton and Charity Mbachi opened a new restaurant in Kasungu’s high street called Tupo’s kitchen. Tupo’s kitchen is open from 6am in the morning to 10pm at night and serves around 150 covers a day during week days and a little less at weekends. Favourite meals are chicken, beef or Chambo fish served with rice, nsima or chips. However Charity will also turn her hand to whatever the customer requires. So do not be surprised to see a large number of American volunteers tucking into American chicken cooked by Charity produced with the help of a recipe off Google. Due to relatively low wages, small businesses can employ a lot of people. Charity and Atherton employ 11 people including 3 chefs; 3 waiters, a cleaner, a cashier, a buyer and a supervisor. One of their biggest investments since opening has been in a second but much larger deep freeze so they can always hold supplies of fresh fish which is much in demand. Saju supplies fertiliser and pesticides to farmers as well as equipment such as hoes and sprayers. Agricultural supply shops play a critical role in Malawian farming because they not only provide inputs but are also the main source of advice to smallholder farmers. So they play a key role in helping to alleviate poverty. Julius has 8 permanent employees in his existing 3 shops and will hire three more staff shortly for a new shop in Mzuzu. In the coming year Julius will also hire around 14 seasonal staff because he has been appointed as an agent to help in the government program to provide inputs to farmers. Khama (meaning ‘hard work’) grew out of a knitting and sewing project financed by the UK’s Big Lottery. When the project came to an end a young Irish designer, Elaine Burke decided that she wanted to carry on working with the women and make the project self-financing. With the help of MEA she opened a workshop in Kasungu in 2013 and now markets bags and fashion accessories in the UK and Europe which are made in the workshop. Elaine is also encouraging the women to make goods for the local market so the workshop can have more than one source of work. Khama’s workshop is a real hub of activity. The workshop is based in the centre of Kasungu, amongst a busy parade of shops. There are always people coming and going, which makes it a very sociable place. People also drop by to browse, arrange private commissions, or just to sell their latest crop of vegetables – tomatoes, or ‘money-makers’ as they’re called, are always popular. The number of women working in the centre is around 10 but this can vary depending on workload. Read more about Khama here.